IT IS ALL TOO EASY to sketch something that looks good, oidy to discover that you have no reasonable way to build it. You either develop overly complex construction methods or sacrifice the design you really want because it's too difficult to build.The solution is to stlike a balance between design complexity and construction simplicity. It helps to start by thinking of a piece in its most basic form, then develop a single construction system that can accommodate a wide range of design options. I hke to tell my students at North Bennet Street School that a sideboard is little more than a box with legs attached. Though it sounds oversimplified, this approach puts things in familiar terms — everyone knows how to budd a box. It becomes a question ofhow to bluld the better box. 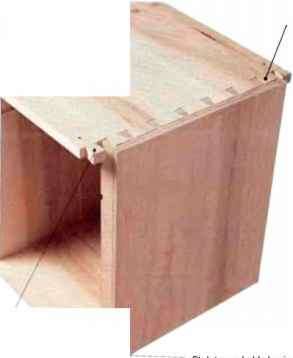 Historically, sideboards were built using post-and-rad or frame-and-panel construction, but 1 prefer this method, which calls for a dovetailed box turned on its side My alternative approach is less familiar, but when you start counting the joints necessary to budd a frame-and-panel sideboard, you understand the logic of a dovetailed design.With this method, there are fewer joints to cut, and the ones you do cut aren't seen, so there's no need to be overly meticulous. This construction system is based on a few rules concerningjoinery: Ifa case part joins another at a corner, dove tad it; if one part meets along another's length, use multiple tenons. 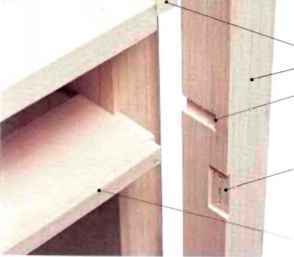 Dovetads and tenons are both strongjoints that allow for wood movement and resist racking. Because all of the structural parts ofthe case have grain running in the same direction, the case expands and contacts together. Put simply, the case is still just a long, dovetaded box with legs attached. .---Coarse dovetails hold case together. Legs and ease ends arc made from a single pici c of 8/4 stock. Drawer frames are set into stopped dadoes. Thick case ends provide a large glue surfacc for the legs. Top is screwcd to case from underneath. Legs are dovetailed into top ot case. By building what is essentially a box turned on its side, a dovetailed design allows you to align wood so that all grain runs in the same direction, eliminating problems with wood movement. By carefully planning the cuts, a single 8/4 board can be laid out to form leg-and-end assemblies that appear to be a single. solid board. The legs are cut from the straight-grained edge ofthe board, and the ends are book-matched and laminated from resawn stock. When the legs join the ends, you're left with virtually invisible gluelines. Legs and end-stock for both assemblies Is laid out on a single board. Once the ends have been laminated, legs and ends are £ planed at the same time to ensure uniform thickness. Leftover stock is sized and laminated so that the ends can be built up to the same thickness as the legs. Parts 5a and 5b are resawn. milled and book-matched at this edge to form the outer side ofthe ends. Straight grain on legs meets straight grain on each end. disguising the glueline and leaving an assembly that appears to be a single, solid piece of wood. Coarse dovetails are later covered by the top. Narrow dovetail accepts top of leg. 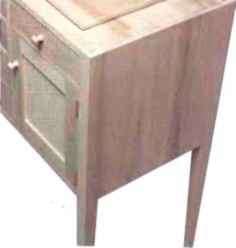 A simple dovetailed box is modified to accommodate the legs. Dovetails can be cut coarse (with wide pins and tails) because the top will later cover them. Narrow tails at the front and back ofthe top and stub tenons at the case bottom are later fit to the legs. retain a family resemblance based on the construction system. The mocked-up sideboard shown on these pages is the most basic variation of this system, but it lays a foundation that can be used on more complex designs. Once you understand the construction system, you can focus on design and build in styles ranging from Federal to Arts and Crafts. A sideboard is typically a tall case piece that's often 40 in. high and taller, a convenient working height for a standing person. The height ofa sideboard makes anything displayed on its top more visible because it isn't overpowered by the forest of chairs surrounding a dining-room table. A sideboard is also strongly horizontal because the tall legs hold the mass ofthe case off the floor and because the case length exceeds the height. The open space below the case keeps the sideboard from appearing too massive, an effect you get with many large case pieces. With lengths of 4 ft. and 5 ft. being common, the facade can be divided using a combination of drawers and doors (see the drawings on p. 116). In designing the mocked-up poplar sideboard seen on these pages, I wanted a simple piece with a country feel. In form, it refers to the Federal period but avoids the use of veneers, inlay, and hardware seen in period, high-style examples.To simplify construction, I decided on a small, four-legged version without the curved facade often seen in Federal examples. Country furniture makers made similar design choices in earlier times, using the grain and figure oflocal woods or even painted finishes to give a piece visual interest.These designs rely on proportion and line to create a sense ofbalance and harmony. tenons on the partitions are housed in mortises cut into the case. Through-mortise nessed to the same dimension as the legs. The thicknesses ofthe ends provide large glue surfaces for the legs. 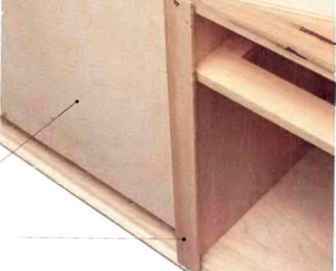 In addition, the top and bottom join die legs and ends without having to be notched around the legs.This structural solution creates a lined interior for the cupboard areas. The partitions that divide the facade are not oidy design variables, but they are also structural elements. The multiple stub tenons tying the long top and bottom together eliminate sagging almost completely. All ofthe drawers run on frames let into stopped dadoes. In a real project, if saving primary wood is important, all ofthe case parts other than the legs can be made ofa secondary species and faced or edged with your primary wood. Using a less dense secondary species also saves weight. 8/4 stock, you're able to show a book-matched pattern on the ends.The inner part of each end is glued up from the leftover pieces ofthe 8/4 stock.This is a nice way to keep the legs from appearing as though they were stuck on as an afterthought. This effect is enhanced by good grain matches on the legs and ends, which make each assembly look like one solid piece (see the drawings on p. 1 12).This is particularly effective if you can choose an 8/4 board that is flat-sawn and wide enough for the edges to have growth rings running at about 45° (as seen on the end grain).This gives you straight grain on the legs, which helps disguise the glueline. As a bonus, the adjacent faces ofthe legs also match each other. Stopped dado accepts drawer frame. By housing each leg in a narrow dovetail at the top ofthe case and a stub tenon at the bottom, the leg can be slipped Into place from underneath after the basic case has been assembled. Stopped dadoes are cut to accept the drawer frames. Cutting the dadoes with ends and legs clamped up before assembly ensures perfect alignment. The exposed top is screwed to the top ofthe case from underneath. Leg to be glued to case end. Finding* the Right Proportions ith a sideboard, as the case gets larger and the negative space between the legs grows smaller, the piece begins to look more massive. But take a look and compare cases 1 and 2. Case 1 is far more delicate in size, but the case divisions give a static effect because they are based on squares and 2:1 rectangles. Although case 2 is much bigger, both the vertical rectangles of the doors and the graduated drawer sizes help relieve any sense of heaviness. What if the drawers were the same size and the doors more square? Putting the doors on the outer parts of case 3 leaves the drawer compartment overpowered, at least to my eye. Even though the initial placement ofthe partition gives equal divisions, once the central space is divided, it looks too small. Case 4 uses proportions that I often rely on. Leaving 50% in the middle gives a strong impression but is not as obvious to the eye as halves or thirds. Dividing the total sideboard height in half is also satisfying but remarkably subtle because it takes a moment to see the relationship of the positive space to the negative. Overall. I like the interplay of vertical and horizontal rectangular spaces. But I would still be willing to adjust things by eye to get a more pleasant drawer spacing, for instance. For me. it's less important that the height be exactly divided in half than it is for the divisions of space to produce an impression of these proportions. edge-glued, skim them with a handplane before gluing them together. Alignment is much easier if you leave the parts long at this stage. The extra length allows you to nail the parts together in the waste areas when you clamp them up. The laminated parts should be given several days to move and reach equilibrium. After they are done moving, both the leg blanks and the ends can be flattened and dricknessed at the same time.When you trim the ends to finished lengdi and width, remember to keep the book-match line centered and parallel to the edges. The top and bottom ofthe case are milled and glued up like any large panels, then cut to final size.The dovetails that hold the case together are fairly easy to cut, either by hand or machine, but remember that the layout is different at each corner where a legjoins the case (see the photos on p. 1 13)-The top rear dovetails are cut narrow to make room for the back boards where the leg will be rabbeted.The case bottom has stub tenons that will be housed into the legs. These tenons are shouldered so that any later sanding won't change the fit ofthe joints. Once the piece is finished, none oflhe joinery will be visible, so the dovetails can be coarse (with wide pins and tails). The partition joints are somewhat fussy to cut, but they add considerable strength to the case (see the photos on p. 1 14). Shallow stopped dadoes are used to locate the partitions. 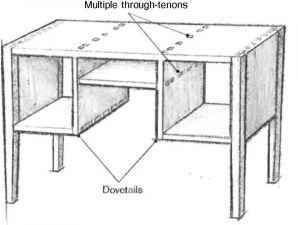 Tenons are positioned on the partition ends so that there is extra holding power at the edges with enough tenons across the middle to help the top and bottom resist sagging. The partitions are held in line by the dadoes, which makes fitting the thickness oflhe partitions to the dadoes careful work. Partitions should be cut a bit longer than the ends to leave some extra tenon length for final flushing. Because the partitions are fully housed in the dadoes, there are only small shoulders at the front. It is very important drat when clamped, the tenon shoulders bottom out in the dadoes, keeping both the top and bottom oflhe case parallel. Router planes can be fussy, but because the depth should be consistent, 1 took the time to run one through the dadoes oflhe mock-up. To gauge the front shoulders, work in from both ends wilh a culling gauge at the front until what's left between the lines equals the distance between the base oflhe pins cut on the case ends. Then add the depth oflhe dado and mark the space between the tenons.The trick is to get the small front shoulder to close at the same time that the end grain between the tenons bottoms out in the dado. 'l'his ensures that the top and bottom will remain parallel. Once die tenons have been cut, locate the mortises in the dadoes. 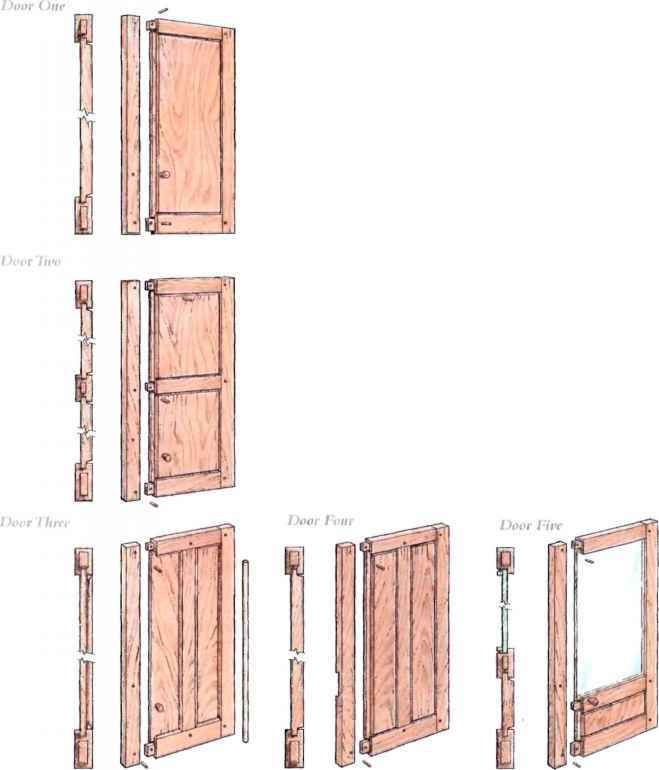 Line up the fronts of the partitions wilh the front ofthe case and mark around the tenons to establish your mortises. There is no need to run the tenons through, but it does add strength and keeps you from having to clean the bottoms oflhe mortises, Wi e n the partitions fit squarely into place, you've finished framing the basic case. 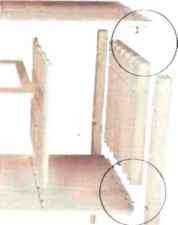 The legs are mortised to accept the stub tenons cut into the bottom board (see the photos on p. 115). 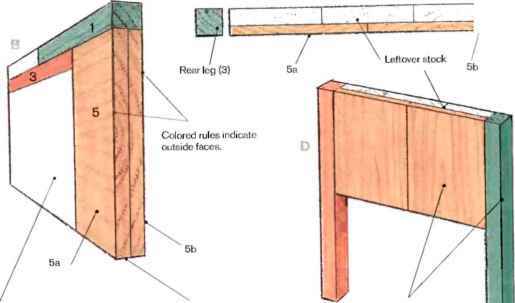 Because these tenons and the top dovetails share the same shoulder hue, the legs should register flush to the case ends. Once the top dovetails are let into the legs, you can't trim any more wood off the legs and ends, so make sure this joint is accurate before you cut it. This method puts one serious requirement on the legs. They can be sawn to shape, turned or carved, but the solid glue surfaces must meet the case ends. To guarantee alignment, it's best to cut the dadoes for the drawer dividers using a router wilh the case ends and legs clamped up. Once the stopped dadoes have been Cut, the case construction becomes fairly ordinary. Morti se - an d-te non frames that separate the drawers are glued in the front 3 in. or so but not at the back. Leaving space at the back ensures that when the case shrinks the frames don't push against the back ofthe case. Both the frame-and-panel doors and the dovetailed drawers are built using the usual methods, but 1 put small vertical stops behind the doors. 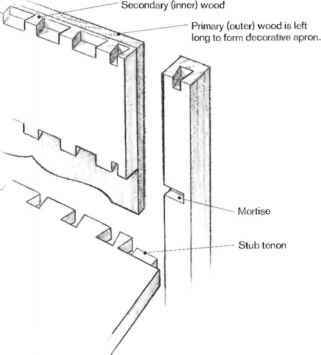 No matter how you change the design, the rules of construction are simple-dovetail joinery is used at all corners, and multiple through-tenons are used where a board joins another along its length. With the primary wood cut long and glued onto the secondary wood, an apron is formed and can be accented with scrollwork inlay. Cutting the secondary wood shorter allows you to employ the simple construction methods used on the basic case of the mock-up. The rear legs and the bottom are rabbeted to accept the back. The back on the mock-up is a series of 'A - in. panel s held by rabbeted cleats that are attached with screws.The top is ripped even with the bottom of the back rabbets so that the back boards run up to the exposed top. (This is not critical, but it does make it easier to fit the back.) A more elegant solution would be to resaw thin shiplap boards and run them vertically across the back.The top can be cut to allow some overhang, then molded and screwed down from below. board lop and bottom.While it does use extra wood, it also adds strength to the case, resists cupping at the ends, and provides built-in kickers for the top drawers. As a substitute, you could use two wide rads, with gussets or without. If your design has no cupboard space, you could use similar rails at the bottom. To allow for wood shrinkage, remember to fit any kickers with gaps at the shoulders and leave the rear tenons unglued. The case ends could also be thinner than the legs, creating either a reveal where the ends join the legs or a recessed nook inside the case. Because of the added complexity of the case dovetads and drawer frames in the latter option, I would use it only ifsaving weight or wood is an issue. It's easy to add decorative aprons between the legs (see the drawing at left). At the lamination stage of making the case ends, glue on the outer layer long at the bottom.This creates a large lap for the dovetails, which, as before, are cut flush on the inner layer of the end. The outer layer hangs down and can be sawn to shape. To add an apron across the front, the bottom can be cut back and an apron piece glued onto the edge of the bottom. If the apron is wide at the center, it can be braced from behind. Ifit is wide at the leg, it should be tenoned into the leg to prevent racking and twisting. The most common change to the case is to have the bottom step up in the middle. This introduces movement, breaks up the strongly horizontal case, and allows different ways of arranging the doors and drawers. This type of case construction is more complex, but it uses the same joints as before (see die drawing on p. 1 17). fust remember how this system works: Ifa case partjoins another at a corner, dovetad it; ifa part meets along another's length, use multiple tenons.When you add a step up in the center of the case, only the fitting sequence changes. First cut and fit the multiple stub-tenon joints between the inner verticals and center bottom panel. All of the stub tenons can be cut at the same time, but put off dadoing the top until the center panel is in place.The important thing here is to keep the inner verticals parallel. If the center panel clamps up shorter than planned, it's easier to move the dadoes in the top board (and make the center section smaller) than it is to live with verticals that aren't perpendicular to the case. Now fit the dovetads of the ends to the top. While cutting the outer bottom panels, you can make any necessary adjustments. The most important thing is to keep the verticals parallel. Many things can creep in to change the exact locations of the verticals, but the top now tells you the actual distance between the inside faces of the verticals, a measurement that is more important than the overall length of the bottom pieces. So if the bottom location changed or you cut the bottom a bit short, adjust the gauge line for the dovetails until the distance between them is the amount required. The slight change oflength in the tails is absorbed in the lap of the pin piece. As before, the space below the raised center section can be filled with decorative apron pieces. In designing a sideboard, it's important to consider the visual effect that the proportions and construction methods will have, then choose ones that help express the intent of the design. Before considering any decorative effects, sketch a few cases of different sizes and proportions. Then use tracing paper to try out a variety ofpartition locations and to vary the door and drawer sizes.This exercise gives you a sense ofhow changes in proportion alter the effect. You may find yourself discarding all of these sketches, preferring to develop a second set using your eye to judge correctness. Rabbeted cleats are screwed to the rear top and bottom of the case. Three panels of !4-in. plywood slide easily into place. 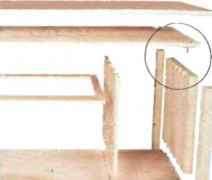 The methods used on the mocked up sideboard should provide the basics of construction. Most of the alternatives discussed don't really change the construction methods much. They are additions to the basic-case that either save wood or provide surfaces for design options. More complex cases are possible, but they are all offshoots of this basic method.You can choose details to design a sideboard with a refined period look, or opt for something more contemporary. 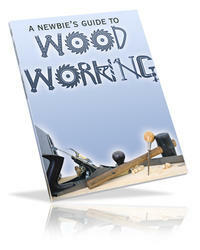 WILL NEPTUNE teaches woodworking at North Bennet Street School in Boston. Mass.